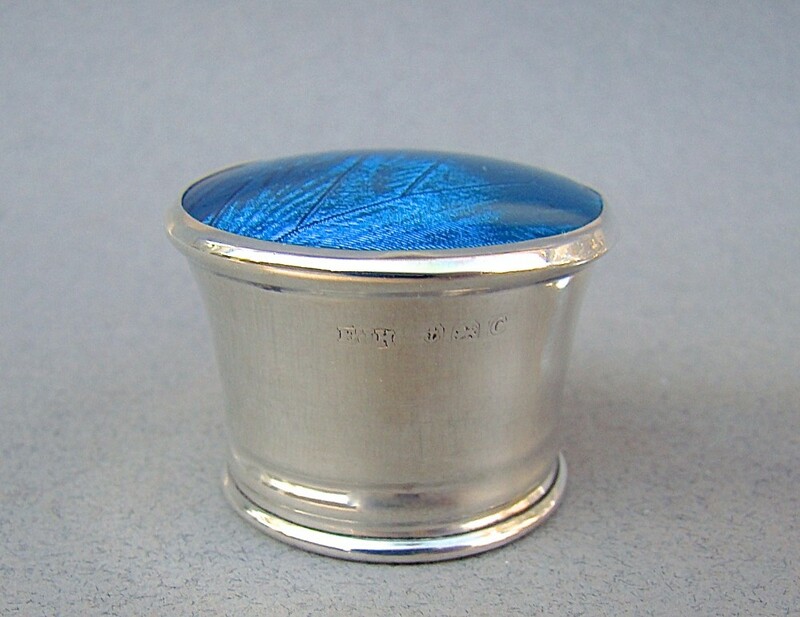 This is a very unusual and striking silver mounted Art Deco toiletry jar. 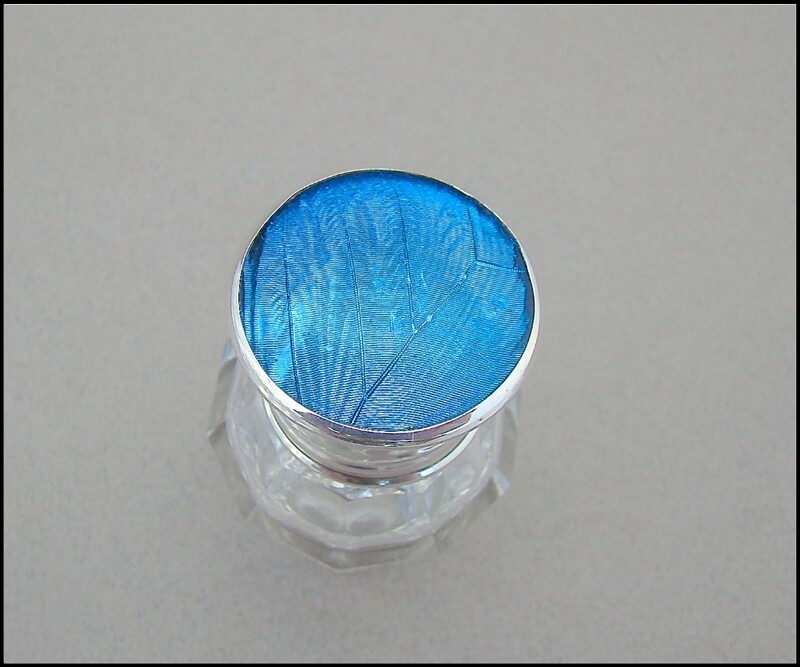 The screw top silver lid with a butterfly wing teal glass inset. 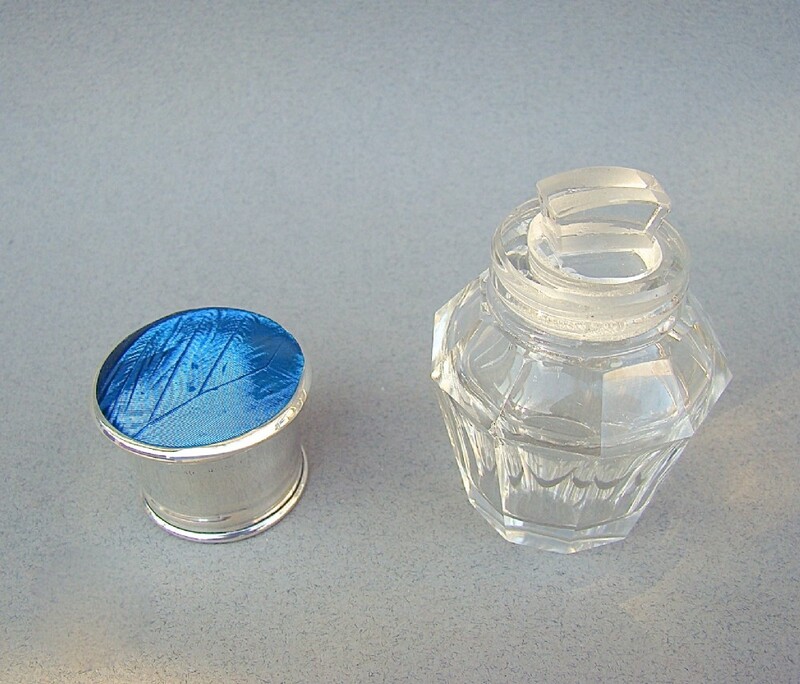 The tapered panelled glass body with original stopper. Date letter "C" for 1927. 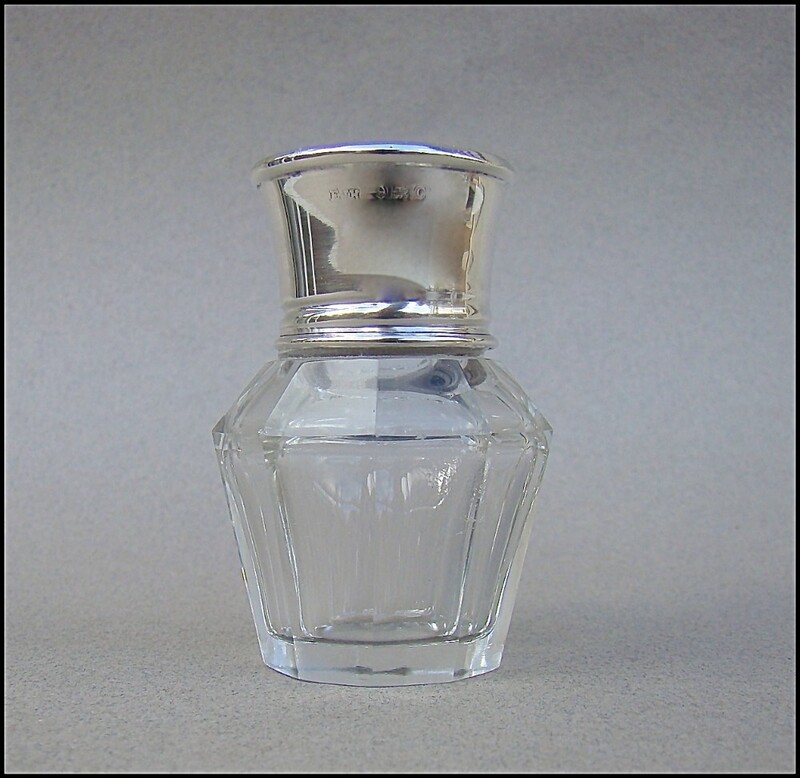 Silver lid in very good condition. Glass in perfect condition. No chips or cracks. Height: 6.5cm / 2.4 inches. Postage UK: £8 Special Delivery Next day. Postage overseas: from £12 International Signed For. You can pay by PayPal, bank transfer, cheque, debit or credit card. To pay by PAYPAL please add P&P and click on button below. This item is antique. The date of manufacture has been declared as 1920. If you are interested to buy an antique that you have seen on Sellingantiques, please contact the antique dealer directly using the contact details shown with the item. All communications occur between the buyer and the antique dealer, Sellingantiques Ltd is not involved or responsible for terms of sale. Exchange rates are updated daily via xe.com. When an antique dealer uploads an item for display on Sellingantiques they are requested to make a formal declaration as to the date of its manufacture. This date is shown on each antique detail page. The use of the word Circa or C. is to indicate that the date is "close to" date shown. Eg. Circa 1920 means close to the year 1920. © 2019 Sellingantiques Ltd - Design, images and content are copyright Sellingantiques Ltd. All antique photos are protected by copyright of individual dealers. Photos or content cannot be reproduced without he written consent of both Sellingantiques Ltd and the individual dealer. © 2001 - 2019 Sellingantiques Ltd. All Rights Reserved. Your comment has been sent to Sellingantiques. Your rating and comment have been sent to Sellingantiques. Your score has been recieved. Thanks. But what can we do better? If you would like to be contacted to discuss your feedback then please leave a phone number or email address in your message. Thanks for your great feedback! We love it when our wonderful visitors are happy with us! 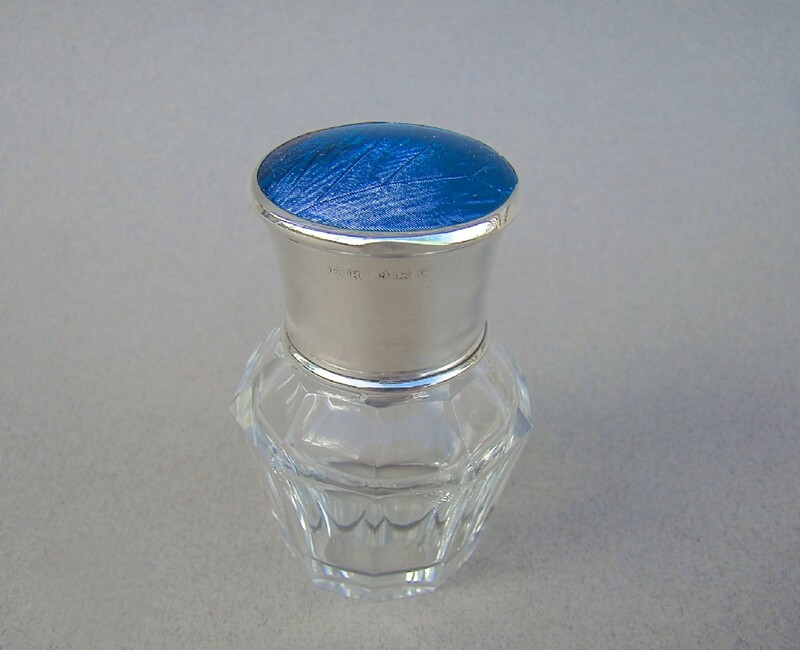 The BEAUTIFUL ART DECO SILVER & TURQUOISE GLASS SCENT BOTTLE BY E. J. HOULSTON, BIRMINGHAM 1927 has been added to your saved items.